A collection of music themed cork coasters featuring a punk rock drummer girl, acoustic and electric guitars, an emo guitarist, violins, record albums, musical notes and Day of the Dead musicians. A sweet music design for the girl who loves to play the drums featuring a cartoon drummer girl, wearing sunglasses and looking very cool and funky. 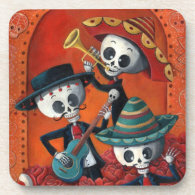 A Dia de Muertos or Day of The Dead design featuring a skeleton El Mariachi, playing musical instruments in traditional Mexican clothes. A beautiful design with an acoustic guitar and musical note with white fresh flowers on a white linen fabric background with orange and yellow roses. Four electric guitars and musical notes, G clef and F clef, with the chord finger positions for the guitar in the background. Perfect for the guitar lover. A super cute chibi style emo boy playing a red and white electric guitar on a red background with stars. Personalize with your own text. 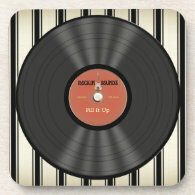 Customize this music themed coaster with the music lover's name and a fictitious song name to personalize this retro style record album design. A surreal music design for the violinist featuring violins and bows floating in air in a circle with a black and white checked floor and large mirror ball. 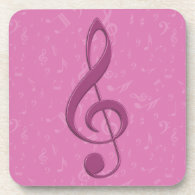 A music design featuring a large g-clef in rouge pink with a satin look effect on a pink background with a subtle background of musical notes. Protect your furnishings with a set of 6 coasters with cork-backing featuring beautiful and fashionable musical designs - perfect for any music lover or musician.